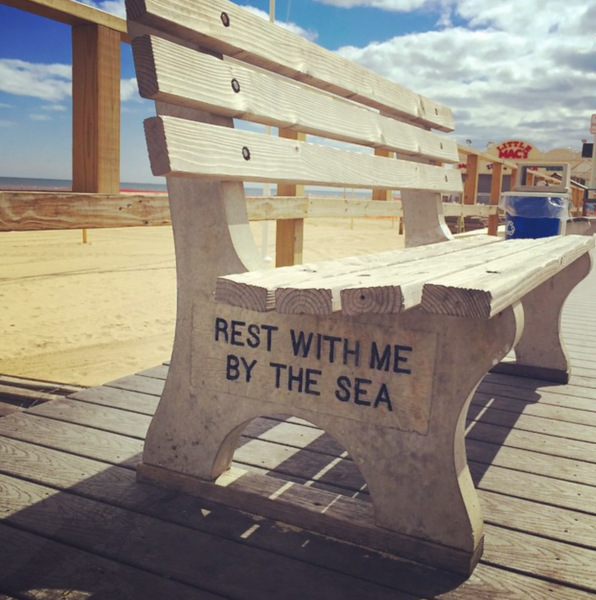 Our favorite spot is Point Pleasant Beach, which is the quintessential Jersey Shore town. Miles and miles of the Atlantic Ocean and a boardwalk full of rides and ice cream and Whack-A-Mole games and happy noise. It had a rough time after Hurricane Sandy, our little shore town, but I’m happy to report that it is back on its feet. Jersey Strong. 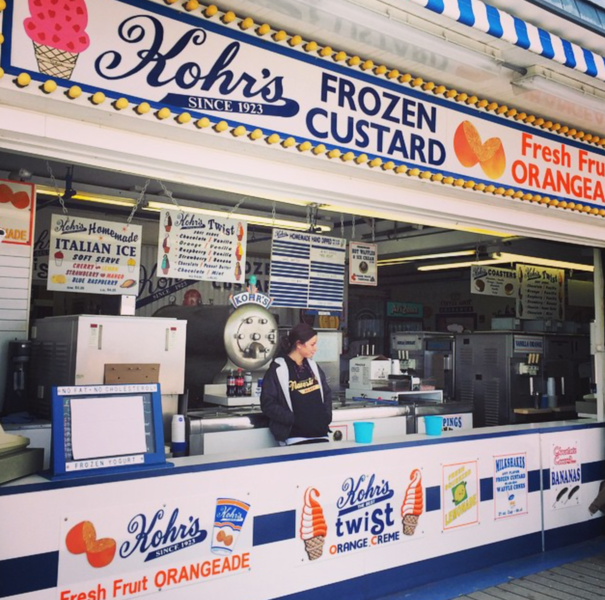 In the summers we walk along the boardwalk and eat ice cream. In the winters we bundle up and walk along the boardwalk again. I love the ocean 365 days a year. 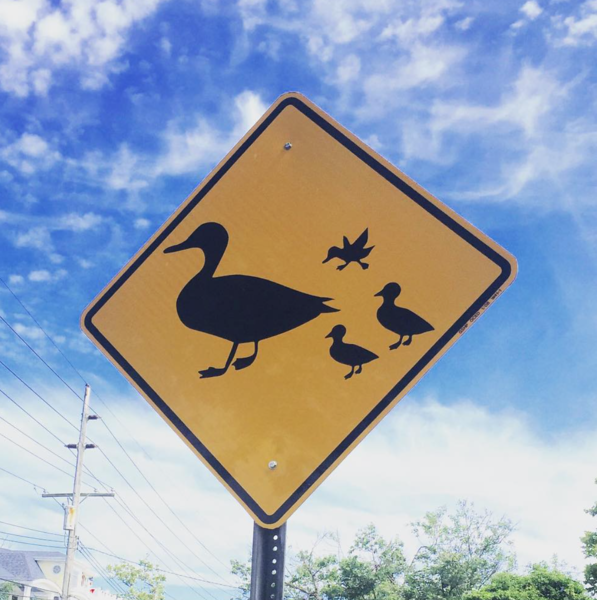 I also love anyplace that has street signs like this one. 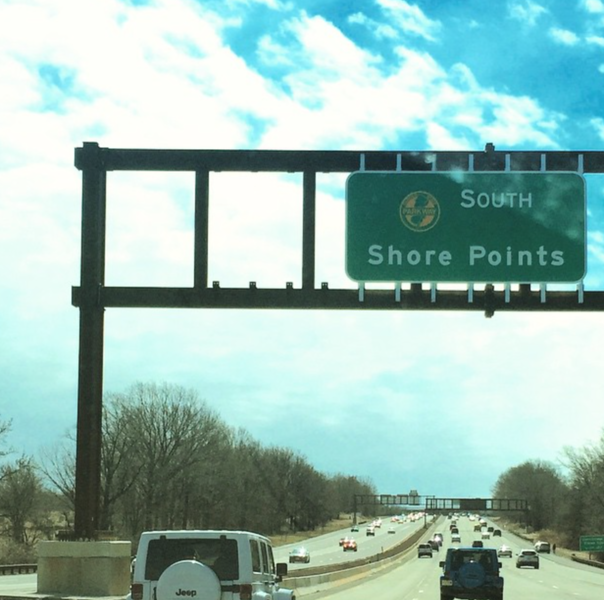 Which Point Pleasant Beach has. And our favorite place to stay…home of the gorgeous pina colada salad…is the Tower Cottage Inn. 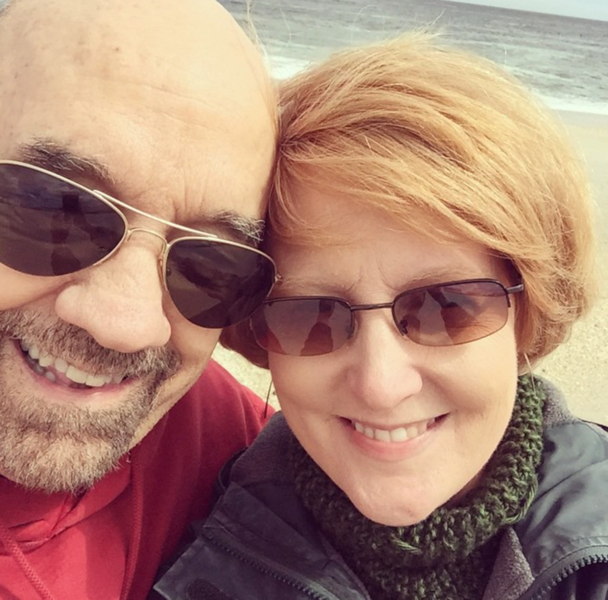 Tony and Maureen are the proprietors, and at this point we honestly feel like family every time we walk in the door of their gorgeous inn, which is right in between the beach and the town. They have several beautiful, beautiful rooms. 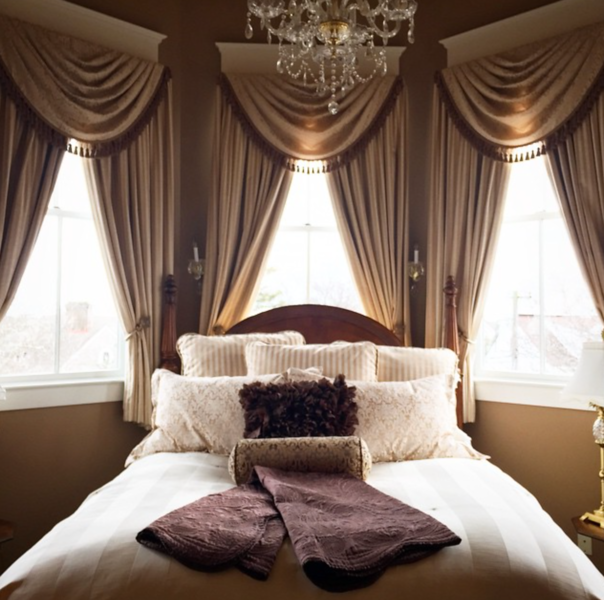 Our favorite is the Tower Suite, which is in an actual tower in the inn. It’s the kind of place where Tony will come outside with a tray of iced tea and cheese and crackers when he spots you lazily reading on the porch, just because he thinks you might need a snack. It’s the kind of place where there are always freshly baked treats in the little dining room, and cold water in your room. It’s the kind of place where Tony will offer to give you his parking space and/or drive you to dinner during the height of the summer weekend crowds so you don’t have to move your car. See? Family. And every time we have been there, Maureen has made us this glorious pineapple fruit extravaganza as part of breakfast. She makes her own gelato to go on top, and mixes in strawberries and melon which you could absolutely do too…I made mine with the fresh raspberries and blueberries that were at our farmer’s market, and topped mine with store-bought coconut sorbet. It tasted scrumptious, and made me look forward even more to our next trip down the shore and to the Tower Cottage Inn. So if you ever find yourself heading down the Jersey Shore, I can’t say enough good things about Tony and Maureen and their beautiful inn…and in the meantime, give Maureen’s lovely pina colada fruit salad a whirl! 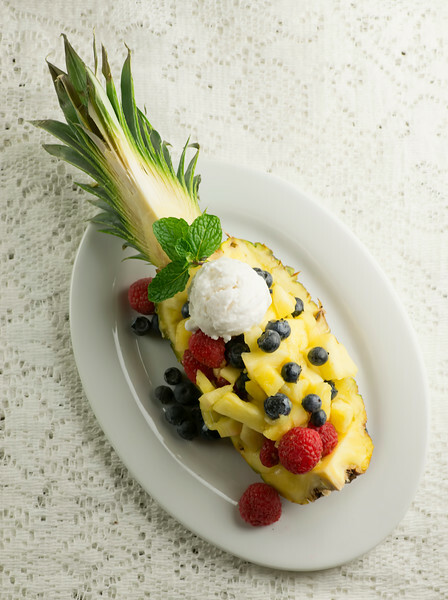 Fresh pineapple serves as not only a main ingredient but also the dish for this dramatically delicious pina colada salad! Run a knife carefully under the pineapple fruit in each quarter. Cut out the tough core at the center and cut the rest into bite sized pieces. Place each pineapple shell on a plate and divide the fruit mixture among each one, letting some spill over the side. 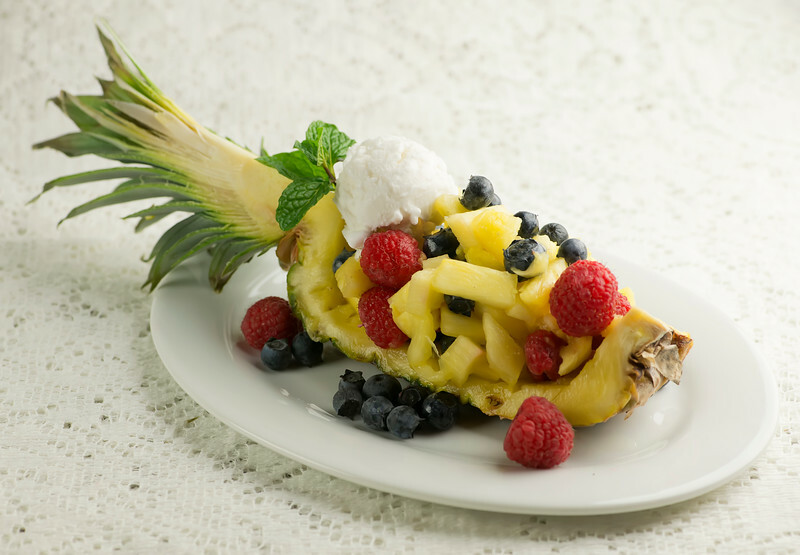 Place a small scoop of gelato on the top of each pineapple section near the fronds, garnish with mint and serve! This is gorgeous! THe presentation is so much more fun than your average fruit salad. Thanks chica! I do love the dramatic look of it – it somehow makes it taste even better! I agree with Joanne.. Beautiful and fun presentation for fruit salad and refreshing sorbet! I have never been to the shore but I was so sad when I saw the devastation from Sandy. I am equally HAPPY that it has rebuilt and that the folks have their livelihoods back.. And you have your favorite place back! I am an ocean kindred spirit and there is no place better than finding a “home away from home”… With the ocean breezes. Gotta go make fruit salad! I knew you would be on my same ocean wavelength! :) :) Enjoy that fruit salad and happy summer! Hi Kennedy – I’m so glad! Let me know how it turns out for you and happy summer! Well you are so right about that!